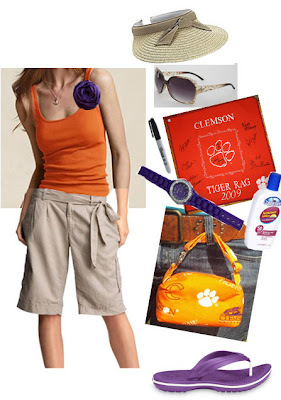 I'm loving the little Clemson bag that attaches to your belt loop - perfect for holding your Clemson Tiger Rag, license, keys, cash, some folded checks, a marker or pen, small thing of sunscreen and lip gloss. The Croc flip flops will keep your feet comfortable and breezy, and these fantastic khaki capris look super comfortable and light. This look is Clemson spirited, cute, and functional for tomorrow's ladies clinic festivities. What are you wearing tomorrow? Tell us!